During May the 11th, 12th and 14th EUEL has organized a “Research Seminar”. The seminar is structured as follows. During the openning session. Dr. Ludwig Kramer will give a speach on “Implementation and enforcement of EU Environmental Law”, following a debate with assistants. The second activity will consist on a working session where professors in the Law Faculty (Dra. Mar Campins, Dr. Àlex Peñalver and Dra. Mar Aguilera) will refer to the principle topics in EU Environmental Law which were presented during the previous session. They will then conduct a new debate with PhD students to work on those aspects. On the third session, PhD students whose research is related to Environmental Law will present the thesis research they have developed following a short debate with other assistants. 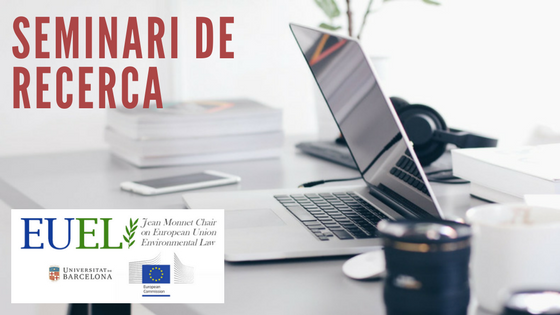 Moreover, we will propose PhD students to pre-publicate some of the results obtained through their research on Jean Monnet Chair of EU Environmental Law webpage. Working session: “Principals aspectes i qüestions de Dret ambiental de la UE”.